Filed under evernote on November 26, 2014. I’ve been frustrated for several months with what I thought was a quirk with Evernote for iPad, that is, no way to display a note full screen to view or edit. It was my assumption that I was stuck with the listing of notes on the left-hand side of the screen. In fact, the solution was right in front of me all the time. Because this was not readily apparent to me, I thought I should share this with others. Below I highlight the quick tap of the screen that will remove the note listing from the left-hand side of the screen and display a note using the full width of the iPad screen. After you touch the 45° arrows highlighted in the image above, the notes listing on the left-hand side will slide to the left and disappear and the note will expand to the full width of the iPad screen in both horizontal and landscape orientations. 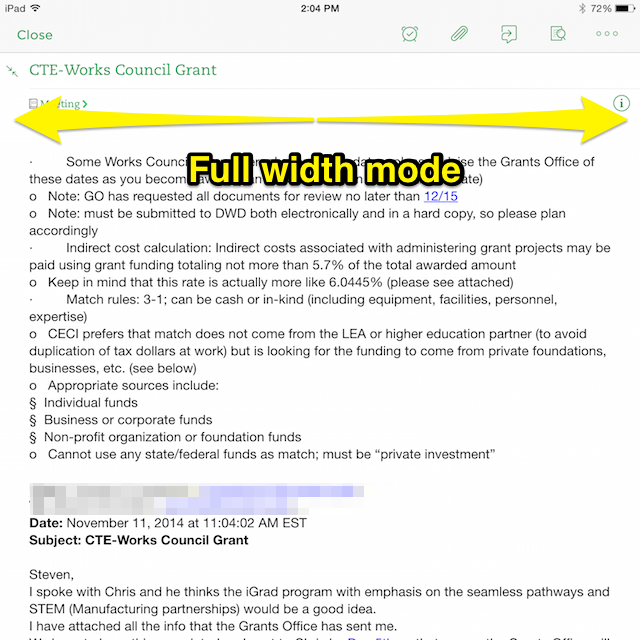 You can now view and edit the note using the full width of the iPad screen as shown in the image below. I feel a bit dumbfounded that it took me so long to find this feature and even more dumbfounded that I assumed the feature was not available. Hopefully this helps someone else. Leave a comment below if it does. Please don’t let me be the only person who didn’t know you could do this.